Shropshire is a growing Town more houses are being built weekly, every day it is someone’s 17th or people realise they need to be able to drive for work.We have Local Trainers that have a vast amount of experience to offer and because we are Local you always have support. 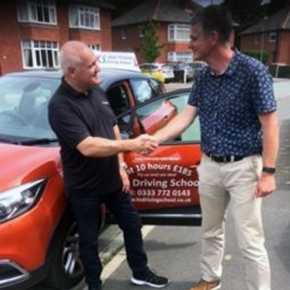 We are one of the most successful and innovative Driving Schools in the area and have experienced massive growth in the last three years when many of our competitors are struggling to survive. You will benefit from extensive personal development on an individual basis and from our regular group training events. Most driving schools will take your franchise fee each month without offering you any type of personal, training or business development. You will benefit from one of the best, cost-effective franchise packages in the industry with a high level of team support and care. Become a Driving Instructor in Shropshire with a Local company that have a lot of experience and will support you all the way on every Part of your Training. Our Results are there to be Seen.If you select K.S.driving School as the driving school you wish to join, Karen will work with you to help you settle in, meet our growing team and develop gradually into a first-rate Approved Driving Instructor. Many people dream of changing their career and improving their lifestyle until it’s too late and then find the opportunity has passed them by. Karen’s Instructor Training can offer you the solution to finally make your dreams become a reality. Your Opportunity is Right Now.With the New Changes coming into Place never been a better Time to Train and train Local knowing all the way you have someone there who have years of experience to Train you not Just to Pass as a driving Instructor but to be a good Driving Instructor give the Best Instruction and get True Customer reviews. We believe we offer the Best Deal national. We are based in Shropshire and have Franchise spaces national no one will give you the level of support, development, and training that we offer on a local basis. Unique to the driving school industry. K.S.Driving School is about the whole Team and I promise I will work hard to get you work so you don’t need to,You do what you Trained to do be a Driving Instructor. We have the best Marketing to Driving Instructor franchise. Within your Franchise you get 4 Weeks FREE A YEAR WHO ELSE GIVES THIS? WE DO PART TIME FRANCHISE WHICH IS 20 HOURS A WEEK ,Facebook Page,Google Page,Twitter. If you want to advance on your Training and want to Train Instructors to Become Driving Instructors we provide courses done over 3 Days please call Karen Direct on 07931673337 for full Details that will be sent to you. Within our Franchise we do Standard test Training that is within the Franchise but we also do Standard Test Training for both A.D.I'S AND P.D.I'S Our Pass rate is very good most of our Instructors are Grade "A" or high Grade "B" passing 1st Time. I would like to thank Karen Jones & John Langford @ K.S Driving School for their training, guidance, support and patience. In helping me achieve a successful grade in my DVSA part 3 exam. The combination of knowledge and teaching techniques enabled me to succeed and reach my goals. Coming from a teaching background I thought that the ADI Part 3 was going to be easy. Karen warned me that this was not the case and it soon became apparent that she was right. However, KS Driving gave me regular training to fit around my work while I was still employed elsewhere and then when I finished my other job we stepped up the training. I had two different trainers (Karen and John Barker) which gave me two views on how to instruct. I found this really useful. Karen taught me how to be clinical with my instruction which when a car is moving is very important. John taught me wonderful ways of getting the students to remember key instructions and how to stay calm and confident in my communication with students. Without their help, I certainly would not have passed my part 3 and then four months later achieved an A grade in my standards check. After taking more Training with Karen and Part of the Franchise that I have with the school.Being a driving instructor has given me control of my working life and it has been a very good career change for me as my work life balance is much better. Karen always told me that within the Franchise that I have with K.S.Driving School it is their policy that Instructors can take advantage of ongoing Training I decided to go for the 1st Standards Test without any Training and Failed.So then Karen took over the Training and had to change my way of teaching well it worked and I not only got a grade “A” but a clean sheet, and I am still working with K.S.driving School and Karen keeps on at us to get a balance between work and social so I’m going on my 1st holiday abroad this year.